(Nanowerk News) Penguins that face the bitter cold and icy winds of Antarctica often huddle together in large groups for warmth during storms. Mathematicians at the University of California, Merced created a model of penguin huddles that assumes each penguin aims solely to minimize its own heat loss. Surprisingly, the model reveals that such self-centered behavior results in an equitable sharing of heat. The results are published in the online journal PLOS ONE ("Modeling Huddling Penguins") and the researchers will discuss their findings at the annual meeting of the American Physical Society's (APS) Division of Fluid Dynamics (DFD), held Nov. 18 -- 20 in San Diego, Calif.
Penguins aren't a typical study subject for Francois Blanchette, an applied mathematician at UC Merced who focuses on fluid dynamics. However, after seeing penguin huddles in the movie "The March of the Penguins" Blanchette realized that the important factors that shaped the huddle, including wind and heat flow, fell within his area of expertise. 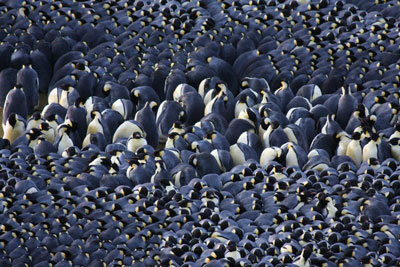 Blanchette and his fellow researchers, Arnold Kim and Aaron Waters, modeled huddles packed so tightly that only the penguins on the outside could move. Each penguin in the huddle generated heat that the wind blew away. By considering such factors as the number of penguins in the huddle and the strength and turbulence of the wind, the model calculated which penguin on the outside of the huddle was coldest. The coldest penguin moved to the most sheltered spot available, usually relocating from a windward to a leeward position, and then the heat distribution around the huddle was recalculated. Repeated iterations showed the huddle gradually elongating and creeping downwind over time. At first the model assumed perfectly steady wind patterns and identical penguins, but produced huddle shapes that were longer and thinner than those observed in nature. When the researchers added uncertainty, which could represent irregular wind eddies and natural differences in the size and cold tolerance of individual penguins, the modeled huddles closely matched real huddles. The researchers were surprised the model showed the penguins shared warmth nearly equally among themselves. "Even if penguins are only selfish, only trying to find the best spot for themselves and not thinking about their community, there is still equality in the amount of time that each penguin spends exposed to the wind," says Blanchette. Not all instances of selfish behavior result in such fair outcomes, he notes. "A penguin huddle is a self-sufficient system in which the animals rely on each other for shelter, and I think that is what makes it fair. If you have some kind of obstacle, like a wall, then I think it would stop being fair," Blanchette says. Currently the researchers would like feedback from biologists before they further refine the model. Gathering experimental data, however, is difficult. "Penguins huddle during blizzards, when the conditions are horrible, and if you're going to collect data you're also going to be in a blizzard in horrible conditions," Blanchette points out. The mathematicians hope their work might serve as a guide for scientists in the field, helping them to know which observations to make to test the model. Blanchette says his group may also investigate how to adapt the model to describe other biological organisms, such as certain bacteria, that move as a group in response to an outside stimulus like food or the presence of a toxin. Eventually, concepts from the model may guide the design of swarming robots that shelter each other in harsh conditions. But for now Blanchette is enjoying a more immediate side benefit of the research: "Nearly everybody seems to love penguins and not enough people love math," he says. "If we use math to study penguins we could potentially teach more people to love math too!"